By Ryan Nugent | February 18, 2014. 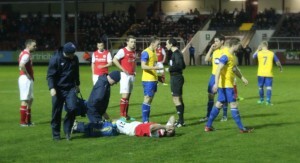 St Patrick’s Athletic kick started their 2014 season with a narrow Leinster Senior Cup victory over Dundalk at Richmond Park last night. As soon as the team-sheets were read out by the public announcer, it was obvious to everyone that this game was about one man only. “And number eight, we are delighted to say…Keith Fahey!” he proclaimed. So it was most fitting that the midfielder, on his return from England where he had a four year stint at Birmingham City, would provide the loyal Inchicore following with a piece of brilliance that bucked the trend of what was a dour game for the majority. Dundalk started off the game the brightest and would have taken the lead only for a magnificent reflex save from PFAI goalkeeper of the season, Brendan Clarke. It wasn’t the last time Clarke would have to avail of his quick thinking to keep the Lilywhites at bay. As the match progressed, the Champions began to take a stranglehold on proceedings and Conan Byrne’s direct style allied with Chris Forrester’s jinxing wing-play provided chance after chance, but although quality ball was going across the box, there was nobody there to convert. The most eventful occurrence of the first half was actually a tackle, well less so a tackle, more so a two-footed lunge. A 60/40 challenge saw St Pat’s Daryl Kavanagh attempt to come away with the ball, with Dundalk’s David McMillan colliding with his opponent very late. 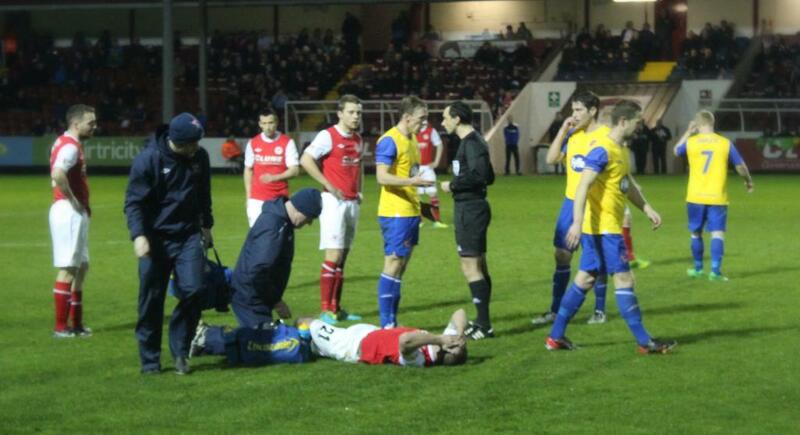 Kavanagh was in agony on the turf, whilst McMillan seemed to be in a bit of pain himself. However it was plain to see McMillan should have walked. Should have, he got away with a yellow and both players continued playing, both playing decisive parts for their respective teams. The second-half continued to the tune of the first half, with nothing of note happening. Daryl Kavanagh had an effort tipped over the bar by Peter Cherrie, the Dundalk net-minder. And then, it became time for Fahey to announce his return to the Inchicore club, in the style befitting of an Irish International. The 31-year old stepped up to take a free-kick 25-yards out just after the hour mark and nonchalantly whipped it into the top corner off the bar, past the flailing Cherrie. Picture a postage stamp between the post and the crossbar. Not only did this piece of brilliance make the entry fee worthwhile, but it also brought a game, which had a definite pre-season feel, to life. Dundalk pushed, and less than ten minutes after Fahey gave the Saints the lead, McMillan, of all people, saw the ball break to him inside the Pat’s area, and he slotted it from right to left, across Clarke into the bottom corner. However, the game remained all square for less than four minutes, as the most fluid move of the match culminated with a perfect cross from Ian Bermingham on the left, picked out none other than Kavanagh to pass the football into the far corner. And that was the last piece of action of note at Richmond Park, with 15 minutes left to play, as the league champions professionally saw out the game to reach the next round, with Keith Fahey playing and adored as if he’d never left.